What would you think if you walked past a building containing a bunch of angry looking prisoners?It’s likely you wouldn’t be too happy about the situation – but that’s exactly what happened recently when a host of orange-clad inmates were ‘let loose’ in France. Luckily, it was no great escape. 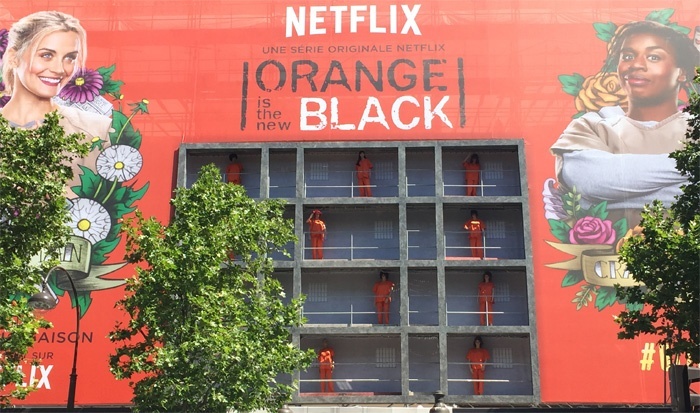 Rather, it was streaming media company Netflix taking to Paris with an exciting experiential campaign to promote the third series of Orange Is The New Black. And what better way to create buzz for the drama than to bring a ‘prison’ to the very heart of Paris? Cast lookalikes, clad in orange jumpsuits, were hauled into a prison bus and taken to a building that had been transformed into a live prison. Each cell housed a prisoner on full display to the public. Acting out the part of frustrated inmates in convincing fashion, they yelled at the guards and even threw paper at pedestrians below. Performing as a real-life billboard, onlookers were able to watch as the women talked and argued, resulting in reprimands from prison guards. Signage was used to promote the popular TV show, and if onlookers in France hadn’t heard of it before, they definitely have now! Much like AMC’s recharging pods for hit UK drama Humans, this fun activation brings fiction to life in a fun and imaginative way that will have led to many people reaching for the remote.